It’s been awhile since I’ve shared a video… so what better time to do that than the present? Sarah and I were chatting about doing a collaboration video in person, but with our ever-changing schedules it’s been hard to figure out the perfect time to film together. 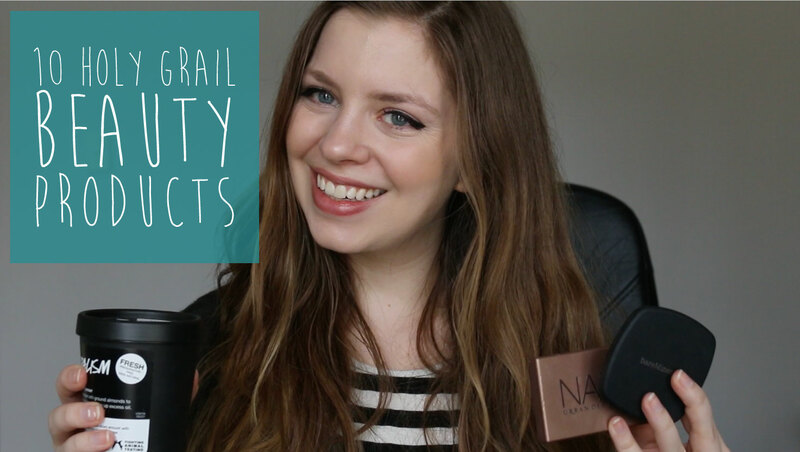 So instead, we’re collaborating by both sharing our 10 Holy Grail Beauty Products. I’m sharing some new favorites, as well as some that I’ve mentioned here before. Hope you found some new favorites to try, and don’t forget to check out Sarah’s Holy Grail products too! It is! One of my all-time favorites from Lush for sure! the maybelline eye age rewind thingymabob is legit my favourite thing EVER. Seriously! I don’t know how I lived without it! Great vid! So glad you tried the Maybelline concealer, it is the BEST! Me too! I had read so many blogger reviews (yours was one of them!) and I still wasn’t sure. So glad I finally just bought it! I love vlogs because it’s so cool to see how you are in person! Also, I keep hearing about the Age Rewind Concealer and I’ve even picked it up at walmart several times but I haven’t actually bought it! You have convinced me to finally go buy one! Thanks! Thanks Chelsie! I like them too for that reason. :) Yes, definitely buy it, it’s totally worth it! NAKED basics palette is my everyday palette! I use it almost every single day! Also love the age rewind concealer! Although it sometimes creases on me, but literally everything creases on me. Even the MAC Pro Long Wear does! Naked Basics is the best! Do you use an eye cream at night? I found it was creasing on me a lot too until I started being more diligent with keeping the undereye area fully moisutrized! I need to get on that Gimme Brow! What’s your Holy Grail dry shampoo? Oh that’s a tough one! Batiste, Klorane, and Oscar Blandi are the best ones I’ve tried. I think for the price, Batiste is the best value. I like the one in the green/blue container. Oh! It’s not even expensive! Thanks for your input! I’m the same way with that under eye concealer. I waited SO LONG to finally get it and regretted not doing it sooner! I know right? I wish I had just bought it sooner, it’s not even that expensive, haha! Great vlog Jenn! I loved the recommendations. Wish I was more videogenic! I’ve always admired vloggers. :o) I’m thinking about doing a podcast in place of a regular written post when I’m in Paris next week. What do you think? Thanks V! I definitely could never do vlogging over blogging, but it’s fun to mix it up every once in awhile! I’ve been thinking about trying some Lush products, but I have a stockpile of Philosophy I have to get through first. I’m dying to experience the fresh goodness, though! Lush has some great stuff, but I’m sure Philosophy is fun too – they both have such great scents/flavors to choose from! What have been your favorites from Philosophy? They do! I love their entire bath/body line but in terms of skincare, I love Purity Made Simple and basically all of the Microdelivery line (my favorite is the brightening peel)! I like Purity Made Simple but I’ve never tried anything from the Microdelivery line! I’ll have to try the brightening peel! Some of these sound really good. I loved the reviews! I love when bloggers vlog! I still intend on buying the Naked Basics one day! Those all sound good, too! Naked Basics is amazing. I just love Urban Decay’s eyeshadows, high pigmented and so the palettes last forever! Some great products, there are a few I want to try. Thanks Karissa, hope you get to try them soon! I’ve heard a lot of good things about the Maybelline Age Rewind Dark Circle Eraser, and I can’t wait to get my hands on them! I read your blog whenever I have a free moment and watched this video around a month ago. The Maybelline dark circle eraser really stuck around in my mind since, you know, I have two young kids and barely sleep. Well, I finally got it today and it’s awesome! Thank you for recommending it! My wife had acne really bad when she was a teenager and was able to overcome it with proper skin care. With that being the case, she is always looking for new ways to keep taking care of her skin and the skin of others well. I’m not sure if she has seen this article yet, but I think that she would love to see the products shown here. I’ll have to show this to her when she gets home from work today and see what she thinks.